In a self-build couple there are normally skills to leverage. With Emily and Graham Bizley the worlds of interior design and architecture have come together, exactly as one might hope, into a building whose inside feels like it belongs to the outside and almost blurs the distinction between the two. 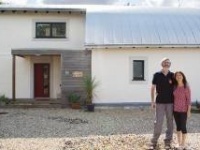 In the same way Dundon Passivhaus, their family home for the last three years, harmonises with its environment and gives the impression it’s been there far longer. In some respects this project began when Graham and Emily first met, because Graham had completed the design of a small self-build in London, which was soon to become Emily’s home too. Graham jokes that with Emily forced to live in his bachelor pad, the discussion of what they could build together began. The one-bedroom property may have worked for a couple but years later when thoughts turned to starting a family, their priorities changed, and they wanted more space and to bring up their children in the countryside. Having bought land at auction for his first build, Graham knew that things could move quickly; and he was right. No sooner had they sold their London home to release capital and started renting, than they discovered a makeshift bungalow from the 1920s with incredible views of the Somerset Levels. Facing southeast, the plot had good solar access for the passive house they desired, so they put in a bid and bought it. Graham, a director at Prewett Bizley Architects, had worked on several pioneering low energy retrofits, which although not down to passive house level, had given him an appreciation for the standard. Sense of place was a central theme for this country house because the plot is adjacent to an ancient apple orchard and looks out onto agricultural land. Graham says: “A lot of houses that are built in rural areas are effectively suburban houses and that’s why one of my main campaigns is against the suburbanisation of the countryside.” This build aimed to enhance its site with a home that would blend well into its context. After all, their nearest neighbour was a Dutch hay barn, a working building from which they drew inspiration. The constraints of the plot, a sloping site of around a quarter of an acre, dictated a fairly compact form if they wanted a garden. Planning was relatively straightforward, aided by Emily and Graham’s decision to keep the new house at roughly the same height as the original bungalow. That meant to afford the space they desired they had to dig into the hillside. It’s actually single storey on one side and two storeys on the other, which they did to avoid the feeling of being underground. As they were not on a rock-bottom budget, Graham was keen to push the envelope of the building. At about £1700 per square metre, the extra budget went into the balcony/veranda structures, the finishes, the materials and the generosity of space. The house has a soft wood timber frame, made of spruce, but to achieve the level of insulation it’s a twin timber frame (with a total thickness of 340mm). The inner frame bears the load and the outer frame, which is hung off the inner frame on plywood gusset plates, provides thermal separation. Warmcel insulation was then blown into the space. The exterior is clad in green oak and there’s an outrigger structure of green oak posts. The loggia works well with the energy strategy because it provides solar shading to the windows while tying in the barn’s exposed structure. Viewed from below, the oak posts mirror the straight Corsican pines on the hill above. The indoor/outdoor relationship has not been left to chance either. Each internal space relates outside either to a terrace or to a part of the garden, and windows of differing sizes frame specific aspects of the view, such as a line of willows or even telegraph poles, rather than blatantly revealing the entire panorama. They also thought carefully about the spaces with some open, some enclosed, and a lower ceiling height in the snug to make it cosier and higher ceiling heights reserved for the master bedroom and kitchen dining space. Another characteristic of the house is internal glazing, which gives a strong connection between the rooms visually. With no main contractor on this project it has been a self-build in its truest sense. While subcontractors were brought in for the groundworks and roofing, Graham and Emily can stand back and marvel in what they’ve achieved. Graham worked full time on site for a year and a half tackling a wide range of tasks, from carpentry and airtightness taping to installing the MVHR system and more. For aspiring self-builders, perhaps most remarkable is how they have emerged intact from their toils and do not rule out another project down the line. The comfort and evenness of temperature is something Emily adores. Reflecting on the project the biggest challenge in achieving passive house was really one of endurance. Graham took on tasks such as airtightnesstaping as a learning experience, but it was laborious. No monitoring has been carried out so far but space heating from the wood burner in the snug costs between £200-£250 and electricity is £800 per year (which also takes into account their home office). Their house has that rare quality of looking and feeling together. 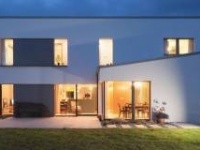 It was also shortlisted for last year’s UK Passivhaus Awards. 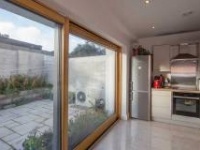 Glazing: Sigg PassivhausVenster triple-glazed timber-framed aluminium clad windows. Passive House Institute certified. U-value: 0.85 W/m2K. Solarlux triple-glazed sliding door & Vitral triple-glazed roof window. 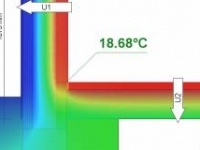 Heating system: Primarily MVHR pre-heated supply air. Also Normatherm wood burning stove. Four square metre solar thermal array with 1000 litre Akvaterm solar thermal store. Ventilation: Paul Novus 300 Passive House Institute certified mechanical ventilation with heat recovery (MVHR) system, 93% efficiency (PHI). Green materials: Rainwater harvesting from roof with 4500 litre storage tank below garden.